For years the normal air wing for the Navy's eight Wasp-class assault ships has included around 10 MV-22 tiltrotor transports, four AH-1Z attack helicopters, four UH-1Y light helicopters, five CH-53E heavylift helicopters and the six fighters, plus a couple of Navy MH-60s for search and rescue. But the L-class Wasps were capable of trading helicopters for fighters. During the U.S.-led invasion of Iraq in 2003, four assault ships each embarked up to 20 Harriers in order to contribute to the coalition air campaign. 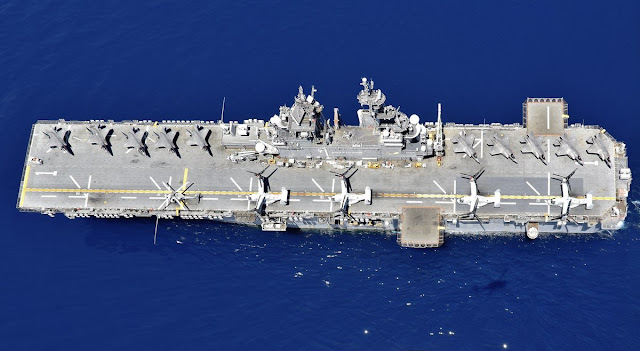 "This is not the norm for an amphib," Senior Chief Aviation Boatswain's Mate Wynn Young, leading chief petty officer of USS Bonhomme Richard's air department, in 2003 told a Navy reporter. "Our air assets dictate that we operate more like a carrier." As the Marines began replacing old AV-8Bs and other jets with "fifth-generation" F-35s, planners dusted off the "Harrier carrier" concept and rebranded it as the "Lightning carrier." Other naval experts simply refer to the Harrier and Lightning carriers as "light carriers." "By 2025, the Marine Corps will operate 185 F-35Bs—enough to equip all seven L-Class ships," the Marines Corps explained in its 2017 aviation strategy. In fact, the Navy expects to operate at least 10 L-class ships, including the Wasps and three, newer America-class vessels. An assault ships displaces around 40,000 tons of water, making it slightly less than twice as big by displacement as the Navy's 11 nuclear-powered supercarriers. A Lightning carrier would embark between 16 and 20 F-35s, compared to the roughly 40 strike fighters that a supercarrier normally carries. A Lightning carrier should be able to sustain 40 sorties per day, the Marines estimated. A new Ford-class supercarrier, by contrast, is supposed to be able to sustain 160 sorties per day. I remember the first time I heard "L-Class Carrier". It was floated out by Amos in one of his talks. When the America class got its well deck back I thought that the idea had been curb stomped but I was wrong. The USMC Ground Combat Element needs to accept the divorce from Marine Fast Air. Marine Fast Air should be viewed in the same light as the USAF, USN, and allies providing air support when possible. This concept for all intents and purposes dramatically alters the Marine Air Ground Task Force. Its something I can't cheer. What's the difference between the US Army and US Marines? Yeah. Its the MAGTF. It's the way we fight with fast air totally integrated into the Commander's tool kit. With the Light Carrier Concept almost certainly a thing, we need to get it done. Marine Air was a great girl but for some reason she no longer wants to be in the relationship. Better to man up and let her go away instead of begging her to stay. This Strike Fighter was designed for rough field operations!